Many animals and beneficial insects rely on ponds that don’t contain harmful chemicals for reproduction. Can you spot the tree frog in this picture? I get quite a few calls about what can be done with ponds that have problems. In many cases a hole was just dug in the ground and allowed to fill with water. 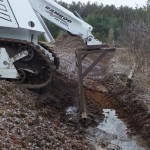 The property owner’s expectation of a crystal clear spring has turned into a muddy mess! The next mistake made is trying solutions in a hit or miss fashion that can end up to be frustrating and expensive. There are real pitfalls for both the professional and the consumer with getting advice over the phone, through the internet or through other media. For instance some pond owners plan to use toxic pesticides in their pond, have set up some aeration that really isn’t working or want to put a species of fish in their pond that might not do well. Because of all the variables, it is difficult for me to diagnose problems over the phone and it is very difficult for consumers read an article and think they have found a solution for their specific situation. The good news is there is an alternative that achieves a high level of success with pond management. Start with a sustainable pond on-site assessment! An assessment will uncover the biological reasons and the supporting science to solve the the problems that you might have with your pond. A visit by a knowledgeable professional that includes interviewing the customer, checking on the pond and deciding the next step of action is the essential ingredient to reaching your goals in successful management of your pond. Small ponds are difficult to manage. Lakes have dynamic forces of wind, water currents, stratification changes and biota that help maintain physical and chemical characteristics of water. Ponds are often too small to have all of the natural processes that occur in larger bodies of water. As users we often expect more from our ponds than other bodies of water-we want to swim, fish and enjoy crystal clear water! As ponds age, organic mater builds up, aquatic plants decay and soil can wash into ponds. All of these thing can lead to depleting the oxygen level in a pond. Just as a healthy compost pile needs to be turned to add oxygen to assist in break down of materials, so does a pond. It is very easy to increase oxygen levels in an existing pond to improve water quality and fish health. 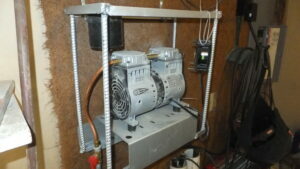 There is a variety of aeration equipment that we regularly install that is produced by Kasco Marine. There are different products for types, sizes and depths of ponds that increase oxygen levels in the water by circulating, de-stratification and mixing. There is a lot to know about this subject. You can contact Eco-Building & Forestry at 715-344-2817 for more information on aeration that is right for you and your pond. 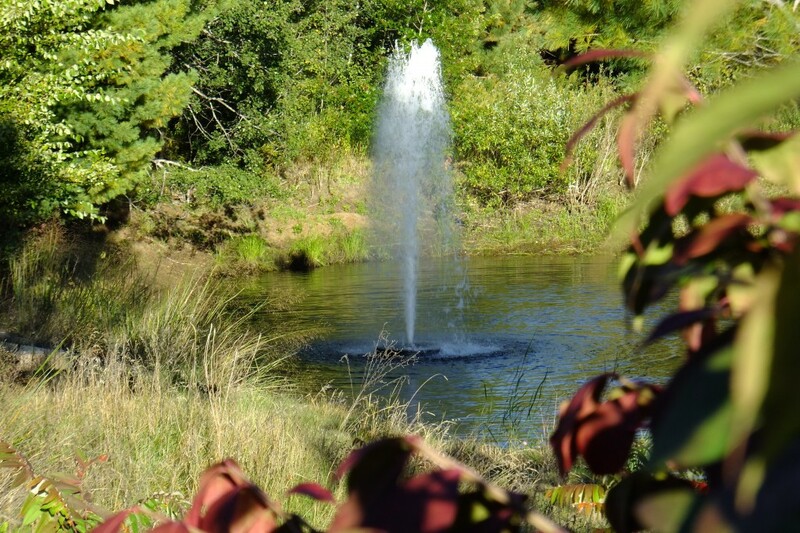 Early fall is a great time to assess your needs for pond aeration over the winter. Did you find dead fish in your pond when the ice melted or was there a foul odor emanating from your pond last spring? If you had either of these conditions, it is time to consider winter aeration of your pond. Most ponds are not self-sufficient in oxygen production during the winter months because they don’t have enough aquatic plants to produce oxygen and the number of fish may exceed the amount of oxygen needed. During the winter a cap of ice and snow tightly seals your pond from natural aeration. Oxygen is consumed by dying plants and decomposing organic material on the pond bottom. Fish in your pond die when the oxygen level goes below what they need to survive. The decomposition process also releases toxic gasses that are fatal to fish. Condensation in airlines can freeze during the winter. Cover and insulate lines, valves and connections. Circulating water in your pond and creating a small opening in the ice is necessary to allow air to mix with water and to release toxic gasses. The most efficient way to do this is with diffuse aeration. 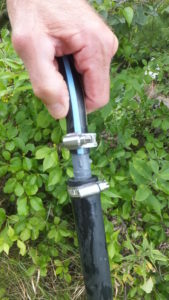 Diffuse aeration is simply a small compressor mounted near the pond with an airline going into the pond and to an underwater diffuser that bubbles air to the surface of the pond. Many people assume incorrectly that it is these tiny bubbles of air that saturate the water with oxygen. This is not true. The air bubbles are simply an efficient way to move a column of water upward to the surface of the pond. This moving current of warmer water helps keep a space open in the ice-covered pond and allows for mixing of the water with the atmosphere to absorb oxygen for fish to breath. There is specific equipment designed for aeration and this equipment can be long lasting and easy to use. It is important to use compressors and diffusers that are efficient in order to adequately oxygenate the water and at the same time to keep electrical bills low. Aeration equipment used in the winter can also be suitable for summer use in your pond to improve water quality and your enjoyment. This can make your investment in pond aeration something that you can enjoy year-round. 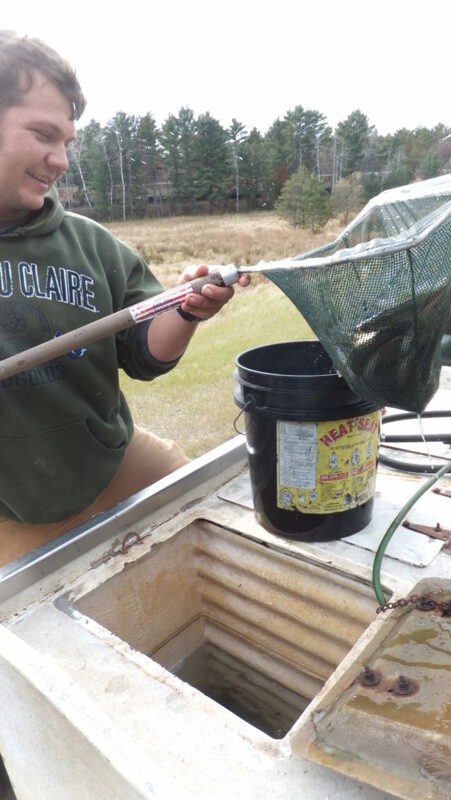 Twenty years ago when we dug our first pond, we were told it was just impossible to raise walleyes in small ponds. Today it is a completely different story! Significant knowledge and sources of information for raising walleyes in northern ponds is readily available. There are now a number of fish farms businesses raising walleyes for stocking both public and private waters. You can raise walleyes in your pond at home, but there are some basic things that you will want to know to reach success. Walleyes are not as aggressive as small-mouth bass or large-mouth bass at catching their food. My experience with small-mouth bass is that they chase minnows right onto the shore and even drag mourning doves into the water – no they can’t swallow them. Removing aggressive fish may be necessary to raise quality walleyes. Fish compatible with walleyes may be fathead minnows, perch and hybrid bluegills. Hybrid bluegills are sterile and so they don’t reproduce and over-populate the pond. Walleyes need forage fish like minnows or young perch. Aeration equipment being prepared for installation on a small private lake that is being stocked with fish. Larval (small fish) feed on zoo-plankton (tiny microscopic animals). Zoo-plankton in turn eat algae. Placing pesticides or dyes in your pond to improve water quality will damage the food sources for all your fish. And who wants to eat walleyes that are tainted with pesticides? Aeration is important for walleyes and other organisms. Most small ponds need aeration during the winter so the oxygen levels are not depleted. During warm months, aeration mixes the water in the pond to create a chemically and physically homogenized environment. Small equipment can be used to create swales that keep run-off water from directly entering the pond that contains excessive nutrients and organic material. Aeration is a good way to improve water quality while providing for the health of your fish. Many authorities assert that walleyes will not breed in small ponds. In reality some reproduction may occur, but not enough to replace fish that are caught, die or are eaten by predators. To improve breeding success rock substrate can be added to ponds. Additionally, water circulators can be added to your pond to simulate water current that walleyes prefer for breeding sites. 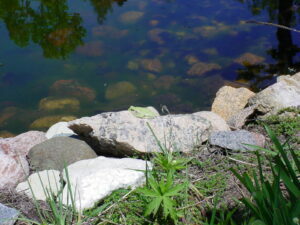 A properly constructed and managed pond on your property can be a real asset. You can create a pond that hosts a variety of species of animals and fish, is fun to use and can provide fulfilling entertainment for all age groups. Remember, a pond with fish and a healthy ecosystem is just another way that you can enjoy a meal close to home and you grew it yourself! About the Author: Tom Girolamo is an author and owner of Eco-Building & Forestry, LLC. He provides international sales and sustainable development as a distributor for Kasco Marine Inc. Kasco Marine is a Wisconsin manufacturer of fountains and aeration equipment for ponds and lakes.